Some people have interpreted this as a slam on Matt Smith as the Eleventh Doctor. Not so! 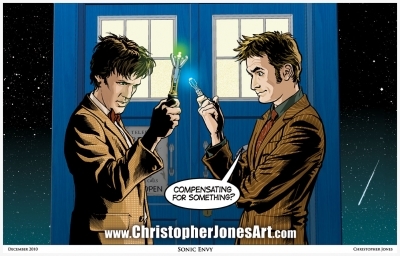 It's merely a response to the new sonic screwdriver, larger than the old model, with a pop out claw on the end! The line art was drawn by hand with pen and ink, color and texture effects were added in Photoshop. The Web Site URL does not appear on the actual print.